Three years after its star-studded launchby President René Préval, actor Sean Penn and various other Haitian and foreign dignitaries, the model camp for Haiti’s 2010 earthquake victims has helped give birth to what might become the country’s most expansive – and most expensive – slum. Known as “Canaan,” “Jerusalem,” and “ONAville” – the new shanty-town, spread across 11 square kilometers, is here to stay, Haitian officials told Haiti Grassroots Watch (HGW). Taxpayers and foreign donors will likely spend “many hundreds of millions” to urbanize the region, and as much as another US$64 million to pay off the landowners who are threatening to sue the government and the humanitarian agencies. Three years after the launch of the temporary model camp “Corail-Cesselesse” – located about 18 kilometers northeast of the capital and named after the nearby habitation (plantation) that was once home to sugarcane and sisal fields – the landscape differs from the orderly camp visited by celebrities. Surrounded by tens of thousands of squatters’ shacks and homes, today it is a cause of embarrassment for local and international actors alike. Before the earthquake, most of this arid, rocky expanse running from the northern outskirts of Port-au-Prince up to Cabaret was largely empty. Much of it is owned by the Haitian firm NABATEC, S.A.. Since 1999, the firm had been developing it into an “integrated economic zone” (IEZ) called “Habitat Haïti 2020” that would have industrial parks, single- and multi-unit housing for various income levels, schools, green spaces, and a shopping mall. A Korean company and a U.S.-based humanitarian group had already purchased land within the perimeter, and NABATEC was in discussions with a number of foreign firms. But today, the land – equal to about three Central Parks – is home to between 65,000 and 100,000 people: 10,000 in the planned camps and the rest squatters. And they aren’t going anywhere. Urbanizing about half of the wasteland will cost Haitian and foreign taxpayers “many hundreds of millions of dollars,” noted David, an architect and the director of the housing section of the government’s Unité de Construction de Logements et de Bâtiments Publics (UCLBP or Unit for the Construction of Housing and Public Buildings). The price tag for initial infrastructure work already tops US$50 million. Despite the controversies, humanitarian agencies like the International Organization for Migration (IOM), World Vision, and the American Refugee Committee (ARC) together spent over US$10 million to build the two “sectors” – which have schools, playgrounds, latrines, and some electricity, but which still lack water. They had planned to build many more camps, including “Sectors 1 and 2” which sat close by. However, as soon as the first U.S. Army bulldozers started to level the land, tens of thousands of people – some but not all of them earthquake victims – invaded those areas as well as land around and north of the camps, “buying” parcels from racketeers, marking off their plots and pitching makeshift tents. Nobody in the central government said anything to prevent the land seizures, which continue today. Many say the land was offered to supporters of Préval’s “Inite” political party for US$10 per square meter. The new “landowners” got fake “titles” in exchange for cash and their votes in the upcoming presidential elections, according to Brun and other sources who asked not to be named. “It was an electoral thing,” said Brun. Police and local authorities have already set up offices in tractor-trailer containers. Despite the unforgiving sun and its sweltering heat, Joel Monfiston is working. Hammering a piece of worn plywood to a battered two-by-four, watering flowers, and picking the weeds out from between rocks and pebbles. The 34-year-old father of three crouches in front of his one-room home in Sector 3. Monfiston and his family first lived in a tent. Now they have a 24-square-meter “temporary shelter” built mostly of plywood and sheet metal by World Vision for US$4,500, according to the agency. Like most Haitians, he survives with a day job here and there and through help from friends and family. And, he tries his hand at commerce. “Things are not easy. Imagine: they put you here, but there’s no work,” he said. Monfiston has dreams. He hopes to set up a shop in the little shed he is building. He would like to grow more in his garden. But those remain dreams. For now, all he has are a few flowers and a few walls for his “store”… no shelves, no door, no cooler, no products. And, like other Corail residents, while he does have access to latrines, electricity (solar-powered street lamps), playgrounds, a clinic, and schools, water is not so easy to find. Back in 2011, the UN and Oxfam promised that a new system of cisterns and kiosks would soon provide residents with water from the state water agency. Two years later, the faucets remain dry. Residents buy water at 5 gourdes (about US$0.12) a bucket from private vendors or from the committees that manage the few still-functioning water “bladders” left over from the camp’s early days when water and food were free and when agencies provided “cash for work” jobs and start-up funds for would-be entrepreneurs. 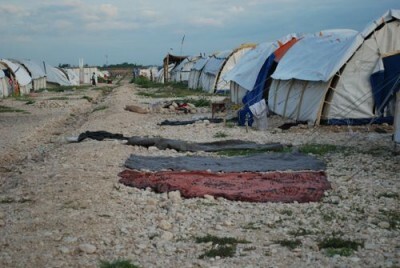 Today, all of the big agencies have abandoned the Corail camp and its 10,000 residents. Trumpeting their success and claiming to have prepared a “transition” to the local authorities, IOM, ARC and World Vision all pulled out (although World Vision still supports the Corail School, which it built). The Croix-des-Bouquets City Hall annex in Canaan is sweltering at midday. The “office” is an empty container and a “conference room” of plywood and a blue plastic tarp roof. Two men there said they worked for City Hall but refused to give their names or allow their voices to be recorded. The absence of humanitarian agencies has one benefit. When agencies were handing out food, jobs, and cash, gangs and “mafias” ran various parts of the camps. An Oxfam program that handed out up to US$1,000 to some – but not all – small business-people led to disagreements, rumors, protests, and eventually arrests. “The NGOs divided us. People fought with each other,” Auguste Gregory told HGW. Gregory was sitting with friends next to his telephone-charging business: a table covered with power strips and chargers. “Some people went to prison. Others went into hiding. We were all there for the same reason, but they divided us,” he remembered. For much of 2010, a gang calling itself “The Committee of Nine” threatened residents and aid providers alike, so much so that ARC Camp Manager Richard Poole quit his job and left the country. “My three months at Corail were one of the most difficult periods I have experienced in my 30 years as a humanitarian worker,” Poole later told HGW in an email interview. ARC received about US$400,000 to manage the camp for eight months in 2010. But, some humanitarian actors say the Corail settlement was not a complete failure. “It is important to look at where the families were at the beginning of the earthquake and where they are now,” World Vision told HGW in an email. The agency says it spent about US$7 million on 1,200 shelters, a school, playgrounds, and various programs. NABATEC president “Aby” Brun is not pleased. At first, Brun said he and NABATEC hoped the government and the major reconstruction actors would intervene to eject the squatters and camp residents, or to at least turn the camp’s temporary shelters into permanent houses so that they could become the beginning of Habitat Haïti 2020 [see Capitalizing on Disaster?]. In the meantime however, Brun deplored the fact that the Michel Martelly government decided “follow the same abusive logic” and seize two other pieces of NABATEC land: one at the corner of Highway #9 and Highway #1 to build a waste treatment facility on what was slated to be an industrial park, and another, across the road, to build the offices of the Haitian Olympic Committee. Those two pieces had been valued by the government tax office – theDirection Générale des Impôts (DGI) – at US$10 million, according to Brun. As months went by, the NABATEC partners – some of them members of Haiti’s most economically powerful families – realized their project would no longer be possible. Now, NABATEC wants to be indemnified, according to the law and the Constitution. The company has submitted paperwork to the DGI and to each of the three Finance Ministers who have held office since the “public utility” declaration. “The last ‘refresher’ meeting was under Marie-Carmelle Jean-Marie about three months ago,” Brun said. Jean-Marie resigned in April, allegedly over differences of opinion concerning a series of no-bid contracts and other expenditures. All told, if the government reimburses NABATEC for that land and the land currently occupied by the camps and the squatters, NABATEC is due US $64 million. Hoping to confirm Brun’s statements, HGW made almost a dozen requests for interviews with DGI officials, in writing and in person, over the course of three months. Finally, in February 2013, Raymond Michel, head of the DGI’s property division, promised an interview, noting: “This dossier is very, very sensitive.” Michel never contacted HGW again. While NABATEC lobbies the Finance Ministry and the DGI for monetary compensation, another branch of the Haitian government is also seeking monies, but not to pay the landowners. Instead, the UCLBP hopes to take NABATEC’s place and build its own project: the urbanization of about 500 hectares for a population of 100,000. According to David, an initial plan is ready, thanks to the Canadian firm IBI/DAA and the Haitian firm SODADE. Asked about the plan and how much it cost, the architect declined to give the price tag and added that it had not been put out for bid. Instead, it was tacked onto another plan already being drawn up by IBI/DAA, which is a frequent beneficiary of government contracts. “It is a very perfect plan. It has roads, it has water systems, it has sanitation,” David added, but he said that HGW could not see because it had not yet been approved. Preliminary infrastructure work for a site will cost “about US$50 million.” But the proto-slum won’t turn into an organized neighborhood any time soon. Among other challenges, the residents who have marked out “their” land will have to be convinced to move to make way for infrastructure. “It’s a very long term project,” David admitted. In the meantime, newcomers continue to arrive at the no man’s land with bundles of belongings, tent stakes, and a few cement blocks. Writing about the Corail-Cesselesse disaster in an article and his recent book, Associated Press reporter Jonathan Katz accused NABATEC President Gérald Emile “Aby” Brun of pulling off a “backroom deal” by recommending NABATEC land for emergency refugee camps so that he could eventually offer foreign companies “a ready-made workers community.” Brun was a member of a presidential commission that recommended the site. In extensive interviews with Haiti Grassroots Watch, Brun did not deny that he had hoped the camps might one day be integrated into “a decent and modern housing scheme that had already been approved” as part of the Habitat Haïti 2020 project. But he also noted that the expanse of territory owned largely by NABATEC is the only open space left near Port-au-Prince, which is bordered on one side by mountains and a lake and by the Caribbean Sea on another. “When they were looking for land for debris, land for recycling, and eventually land for settlements, they realized that the state did not have any land larger than the size of a soccer field,” Brun said. Numerous sources, including officials at UN-Habitat, confirmed that “the land problem” was one of the biggest challenges of the reconstruction. Katz never spoke with Brun in person. Brun – who resigned from the commission after Katz’s Jul. 12, 2010 article – said he never dreamed squatters would soon overrun the property. “Why in the world would I have dropped a 14-year planning and investment dream and effort?” he asked HGW in a December 2012 email.